New year, new week and new day. Ran across this saying this morning and it struck a cord. There are mountains everywhere for everyone. They seem to come in all shapes and sizes. We are the ones who have to do the climbing, one step at a time. 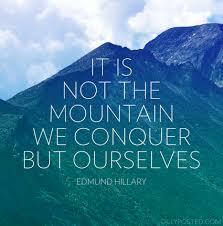 Hope you all have a wonderful Monday and you have an amazing view from the top of your mountain.